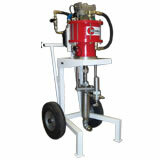 Single Component Pneumatic Airless Spray Unit mounted on 2 wheel cart unit. Standard unit is 73:1 ratio and powered by a CoverCat 290 Air Motor. Maximum fluid delivery 232cc/cycle 9.2ltr/min (2.5gpm) @40cycles. Single Gun or Multiple Gun application of Pre-mixed Coatings. The units are capable of spraying a wide range of materials of differing mix ratio’s and viscosities where these are pre-mixed and possibly with added solvents. Pump units have nitride hardened and hard chromed piston rods and sleeves for long life.